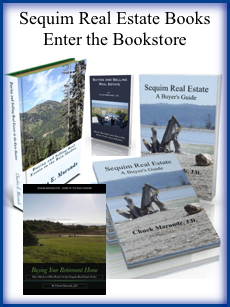 Welcome to the largest Sequim Real Estate Blog with over 2,000 articles. Should I Reduce the Price? Who is #1 Buyer’s Agent? Realtors a Dime a Dozen? What Defines a Good Realtor? What will the Sequim real estate market bring us in 2019? I’m sure most real estate agents are afraid to touch that lightening rod for fear of being proven wrong, but I think my clients and prospective clients would like to know what 24 years in the Sequim real estate market is suggesting to me now. I’ve written several articles in the third quarter of 2018 analyzing the real estate market, the stock market, and the financial markets as they might effect the Sequim real estate market for retirees moving here. There are some dire warning signs of a pull-back in the markets and in real estate sales and prices. You can go back and catch some of those articles if you like. I warned many months ago about the likelihood of home sales leveling off and slowing down around the U.S., and of course, that would effect home sales in Sequim, Washington. Anytime sales slow down elsewhere in the nation, the supply and demand formula eventually makes price adjustments in Sequim and Port Angeles. Such leveling off has occurred exactly as I predicted, and we have been seeing the results in the local real estate market: Sales of homes has slowed down and prices of listed homes has seen price reductions that were not necessary only one year ago. We just turned the corner into 2019, and there are so many unique historical events unfolding, it is hard to make predictions based on past experience and wisdom. We are in the midst of a political environment none of us have ever seen in our lifetimes. Not even close. Who knows how this battle is going to turn out between President Trump and the old guard (the Clintons, Bushes, Pelosi and Schumer, and the war machine). And then who knows how the International financial markets are going to survive 2019, and then there is our own Wall Street and the inverted yield curve on interest rates and debt that threatens our central banking system. The extreme volatility in the markets are signs of a reversal, or as some say, a balloon. And then we are on the verge of war in the middle east every day. Insanity seems to be the new order of the day! It will only take one big domino to start the collapse. My humble advise to you, if you are a retiree planning to sell your home in California or elsewhere, and retire in Sequim, is to move forward with your plans post haste. I would not delay. The longer you wait, the more uncertain the future becomes. Get your home sold, especially if it is in California, while you still can, and get settled in Sequim. In my opinion, you’re running out of time. If I’m wrong about my bad forbodings of 2019, fine, you will still be in good shape if you sell your home, get debt free, protect your capital with conservative investments, buy a beautiful retirement home in Sequim, and settle down in one of the safest places to live in America. Right? Just do it! Indecision now could be the worst decision of your lifetime. Is The Sequim Real Estate Market Turning? What is the Meaning of Days On Market (DOM)? The Sequim real estate market may be turning from a seller’s market to a more balanced market, if not a buyer’s market. Let’s examine what’s happening in the Sequim real estate market now. If you’ve been reading articles on this blog over the past 10 years or even the past 5 years, you would know that we had what I call a 10-year real estate recession, during which virtually no one was building a new home, and prices were pushed down by 30% or more and then went flat for years. But retirees continued to move to Sequim and buy homes, albeit in small numbers. Since they were still buying homes in a small real estate inventory, and builders were not building new homes, it was inevitable that there would be an inventory crisis. About halfway through the recession, I wrote about the darkness on the horizon. I wrote that if retirees continued to move to Sequim and pick off the best homes in the best areas at the best prices, eventually there would be an inventory crisis, and that crisis hit us about about two years ago. The sequence of events went like this. Homes started selling at full listed price. Then we periodically got two offers on the same home. Then prices started creeping upward slowly. I would say that prices have increased by about 30% in the last two years, which is a dramatic increase for the Sequim real estate market. Meanwhile the homes retirees want [Read The Sequim Bell Curve] were selling within days, and now it’s hard to find one in the Sequim MLS. It’s too early to draw a firm conclusion about the effect all this will have on the Sequim real estate market, but it almost certainly will catch up with us. Many retirees moving to Sequim are now opting to buy a lot and build a home, so that is another changing dynamic. And new home listings will inevitably come on the market in the weeks and months ahead. My prediction is that prices have stabilized again, and this means the market is shifting away from a seller’s market toward a balanced market, and this will be good news for buyers. We will still struggle with a low inventory for a while, so this doesn’t mean it will suddenly get easy for buyers to find their ideal retirement home. If you’re a buyer, you’ve got to know how to navigate this kind of market. I advise my buyer clients what to do in this kind of market, and I help them do it. Meanwhile, keep watching the Sequim MLS, and stay tuned on this blog to keep up with the Sequim real estate market. 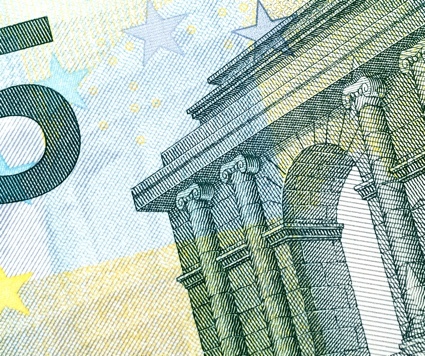 If the stock market collapse is imminent, or at least on the near horizon, now is the time to take money off that table and put it into your retirement home sooner rather than later. Why would I suggest this? I’ll tell you exactly why. If you listen to the talking heads and your financial adviser handling your retirement account, you are undoubtedly being told not to panic in the midst of these huge declines in the stock market and your retirement fund. In fact, many of them are saying this is a buying opportunity. One of their favorites is this one, “remember, you’re investing for the long term, so now is not the time to sell.” What they cannot tell you with any certainty is whether you are about to suffer a stock market collapse. Every time there is a major market crash, they say you should stay in the market, and they also like to say you should actually put more money in the market. Many retirees have sat on their hands while they lost 30% to 70% of their life’s savings. I’m not making this up. This is what many of my clients from California have told me in past years after a stock market collapse. Imagine your retirement account losing $400,000 in value in a matter of weeks because of a stock market collapse. You could have bought a retirement home with cash in Sequim, Washington. I’ve been a lawyer (retired), registered financial adviser (no longer), and own my own virtual real state brokerage now, and it is my opinion that your money is safer in a solid real estate purchase than it is in this stock market. I could be wrong, but there are too many signs we are in a stock market bubble that is about to burst. I’m not giving you financial advise here. Talk to your financial adviser, but we know what he will say. Remember, it is so darn easy for your financial adviser to gamble with . . . your money, but how do you feel about gambling with your life savings? I could be wrong, but if there is a stock market collapse on the near horizon, how will that impact you? Will you wish you had sold a part of your retirement holdings and put them in a retirement home? I’m 63 years old, and I’ve seen a few market cycles, including real estate and stock market collapse scenarios. I’m just trying to give you another perspective, which you won’t get from your financial advisers. Yes, I’d love to sell you a home in Sequim as your buyer’s agent, but this article is not exactly going to make me rich doing that. You do what is in your best interests, but just remember, no one is going to stay awake at night worrying about your retirement account–certainly not your financial adviser who makes money as long as you keep your funds in the market. Except you. You are the only one who will worry about your retirement account, and you owe it to yourself to do your own research to figure out how to protect your financial future as you get older. You and I are too old to start all over, right? Especially if there is a stock market collapse. The Sequim real estate market is unique, and if you’re thinking about buying a home in the Sequim area, it might help to know more about the Sequim real estate market. Sequim has been well known for decades for it’s Blue Hole or “Rain Shadow” as it is sometimes called, and the nearly perfect climate and extraordinary beauty of the Olympic Mountains and the gorgeous pristine bays along the coast have become known all over the United States through retirement magazines and coffee house conversations. For almost 10 years the Sequim real estate market suffered the worst real estate recession in the history of the area. But that came to a quiet end this past year. With real estate prices increasing in other major markets around the country, retirees once again were able to sell their homes and buy their retirement home in Sequim. Home builders did not build homes during the past 10 years, because buyers were not buying land and building homes. There was still a steady stream of retirees moving to Sequim, and so existing homes were selling even if it was slowly and at discounted prices. But that meant the inventory was slowly shrinking, and here’s an interesting but obvious reality–retirees all seemed to want the same kind of property, a three bedroom, two bath 1,800 sq.ft. to 2,400 sq.ft. single level, modern home, with a little privacy. Within this past six months to a year, homes began selling again, and prices have been slowly creeping upward. Today the Sequim real estate market is healthy, although the challenge for many buyers is finding the home of their dreams, because the inventory has been depleted. This calendar year started strong, but slowed down surprisingly in May. In other words, buyers came in fewer numbers in May. May tends to be a busy month for many people, and children and grandchildren are graduating in May. But this is likely to change for the balance of the summer. I expect buyers will arrive in increasing numbers during these summer months, and the competition to find the ideal home will be greater. “Days on market” (or DOM) is a number that tells you how long a home has been listed on the market. The relevance of days on market comes into play when you decide to make an offer on a listing. The general rule is that a large number, like 276 days on market, gives you as a buyer more power to make an offer below the listing price, and a very large number like 500 or more days on market means you can make a substantially lower offer. But how true is this? In this graphic, you can see that for the calendar year 2015 homes that sold in the price range of $200,000 to $300,000 were on the market for an average of 86 days, but one was on the market for 1,102 days and it sold also. For homes that sold in the price range of $300,000 to $400,000, the average days on market was 102, but one sold after being on the market for 873 days. And apparently in each price range at least one home sold the very first day it was on the market. Days on market influences how we negotiate the price on a property, but let’s look closer at the nuances. A large number of days on market may mean that buyers don’t want it. Buyers may be turned off because of many potential reasons, such as the house may be overpriced, it may have features that are way outside the normal Bell Curve, or it may be in an area that the majority of buyers find unacceptable. On the other hand, just because a home is the ideal home for the majority of buyers and is in a good area does not mean it will sell quickly. It could be on the market for only 4 days and sell, or it could sell on the 276th day. In a small real estate market like Sequim, the inventory is small but the buyers come in small numbers, too. This means that a retired couple coming from Santa Barbara will come when they come, which has little to do with the Sequim real estate market. If their ideal home has only 4 days on market when they just happen to arrive, it will be sold. But maybe that same house has been on the market for 189 days when they just happen to arrive and make an offer. This is the nature of a small real estate market and a small number of buyers. Some homes, especially expensive luxury homes, have a smaller number of unique qualified buyers coming to Sequim, so expensive homes will normally have a larger number of days on market than other homes. It is also important to distinguish different real estate markets. Days on market in a hot Seattle market will have a slightly different meaning for buyers than it does in a rural market like Sequim’s. And one last nuance. For the home that has as many as 600 or 800 days on market, there are two main possibilities. The first is that that one unique buyer has not arrived yet, and the second is that the seller may be stubborn and refuses to see the reality that his home may be grossly overpriced. The answer for a specific property requires a great deal of familiarity with the local market, with similar homes, and prices. For that, it helps to have a local Realtor who has the experience and the ability to make the distinctions necessary to determine true fair market value for a specific home, regardless of days on market. The Sequim real estate market in November is interesting. The number of active listings was down 22% from one year earlier. As I have written in previous articles, the inventory has been slowly shrinking as buyers continue to buy at increasing levels and home builders have not been building enough to replace the inventory. The average listing price of homes in November was up to $325,000 from $313,000 last year. The average number of days a home was on the market before selling was down 56% from 146 days to only 64 days. The number of homes sold increased 38% over last year. All of this data is consistently telling us that the Sequim real estate market is continuing to improve on a steady upward trajectory. It is no longer a buyer’s market, that’s for sure. In fact, some buyers are having trouble finding their ideal home because the inventory is low, and when a great home at a great price shows up in the Sequim MLS, it is sold very quickly. My buyers from around the country are having to do their diligence every day by watching the listings at Sequim MLS. This site is a 100% accurate Sequim MLS site that also shows you the status of a listing, whether it is sold or active, and many of my buyers are setting up email alerts so they will be notified immediately if a new listing shows up with their search parameters. I have instructional videos on that site to show you how to set those up. The Sequim real estate market is not necessarily a seller’s market for all homes, but it is for the best homes in the best areas that are listed at the best prices. The Sequim real estate market report for August is especially revealing, because it shows the reality and consistency of the improving trend of our real estate market better than past reports. In the month of August, the number of active listings was down 21% from one year earlier. The median listing price for the month was just under $320,000. The average number of days on market before being sold was down 12%. The median sales price was just over $250,000. The number of homes sold increased 18% year over year, and increased 6% month over month. The reason this is such an important report is because it shows clearly how the health of the Sequim real estate market has been improving in several key areas, including the lower number of days on market until a home is sold, and the increasing price of listings and sales. Sales increased by a whopping 18% over last year. That’s very significant for both buyers and sellers. The Sequim real estate market continues its steady growth. During February the number of active listings was up 2% from a year earlier but down 7% from the prior month. The median listing price was just under $300,000. The average days on market on market was up 9% compared to last year at this time. The median sales price was just under $290,o00. The number of houses sold increased 80% over last year at this time and increased 64% over the prior month. That last sentence is key: The number of houses sold increased 80% over last year at this time and increased 64% over the prior month. Wow. That’s an interesting statistic, isn’t it? Sales have increased, and while that is good news for sellers, it might not be the news buyers want to hear. It has been a buyer’s market for a long time, but that is probably over. That doesn’t mean we have entered a seller’s market, but we are in a time when the Sequim real estate market is finding balance, and that means more normal buying and selling is likely, and prices are going to be more competitive. The Sequim real estate market for December 2014 is interesting. Most Decembers tend to slow down, because closings in December are from sales in October and November, and those months slow down. But the last two weeks of December got very busy at th end of 2014, but those closings will show up in the January real estate market report. Active listings in December were up slightly from last year (6%), and the number of days on market before selling was down from last year. Sales did drop slightly (9%) year over year. With all the buyers who arrived in late December and early January, we are likely to see a pick up in our next Sequim real estate market report and the reports to follow. This real estate market report covers September of 2014 and compares listings, volume, and prices to the prior month and prior year. We continue to see the small Sequim real estate market get stronger, albeit slowly and steadily. The inventory continues to shrink for the ideal retirement home, prices are creeping upward, and homes from month to month are selling in shorter time frames. The number of active listings was down 20% in September compared to last year. The median listing price was up from $314,000 to $338,000. The median sales price was was also up from $205,000 to $270,000. And the time on market (days on market) was down 7%. These are all strong indicators of an improving or stronger real estate market. The Sequim real estate market seemed to plateau about two years ago, roughly, and has been showing signs of strengthening since. In an earlier article I wrote that Sequim Real Estate Prices Are Still Undervalued. No one knows what the future holds, but based on the home sales history in the Sequim area, we bottomed out years ago and have been on a slow upward move. What’s Going on With The Real Estate Market? Is the real estate market overvalued right now? According to the Chief Economist for Trulia, Jed Kolko, the real estate market is overvalued in some markets around the country. There are markets where housing prices are overvalued by as much as 10% in some markets, but he compared that to 2006 when housing was overvalued by as much as 30% to 50% in many markets. When housing is extremely overvalued, people start talking about a real estate bubble. Kolko also said the real estate market in most areas of the country is still undervalued by 3%. 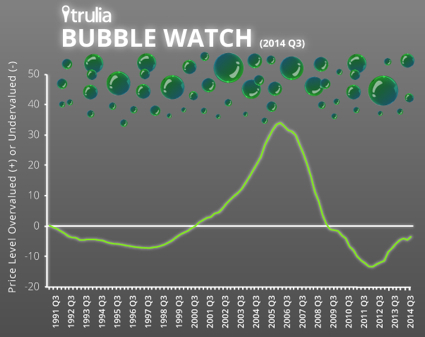 This is shown in the Trulia Bubble Watch graph above. But who has not read or heard about houses in some of the hot California markets where houses have sold the first day for full price, or better yet, had multiple offers above the listed price? Those hot little markets are the ones Kolko is referring to when he says the real estate market is overvalued. The overvalued markets include Austin, Los Angeles, Orange County, San Francisco, and Riverside-San Bernadino. The undervalued markets include Dayton, Cleveland, Detroit, Akron, Lake City and Kenosha City. How does the real estate market in Sequim compare? The Sequim real estate market is still undervalued at this time. Prices have not yet reacted to the theoretical supply and demand curve in two ways. Prices should have started going up because the inventory of the best homes in the best areas has been shrinking, meaning the supply is way down, and at the same time more buyers have been arriving and buying homes in 2014, which means demand is up. Couple those variables with the fact that buyers are strong, either paying cash or having no difficulty with financing, and you have the fundamental elements to push prices upward. But prices have not been going up, at least by much. Homes are selling sooner, and there is some competition now for the best of the best homes in the best areas, but we are still undervalued. In my opinion, that will end soon as prices begin to creep upward in response to what is happening in the real estate market in other states as well as Sequim. What Does This Bifurcated Real Estate Market Mean? It means that the market is not yet in balance. Sequim home builders have not been building new homes for seven years, yet buyers have been slowly picking off the best homes in the best areas for seven years. So the imbalance is real, especially in a small real estate market like Sequim’s. The law of supply and demand will eventually push prices of the existing inventory upward until we do have balance, at which time the price of an existing home will once again be nearly equivalent to the cost of buying and developing a lot and building a new home. The Sequim real estate market has not done anything unusual during August, and you’ll see in this video that we don’t have any significant market trends one way or the other. And maybe that is good news. What I watch for are trends that indicate an upward or downward trend. We all want to see the real estate market improve, and we’d like to get to the point where we can all say with confidence that the market is recovering on a long term basis. Maybe it is. But we don’t have the hard data to say so with confidence yet. There are very few first time home buyers in Sequim. The vast majority of buyers are retirees in their 50’s and 60’s, and they are rarely first time home buyers. This is an interesting demographic reality. Why doesn’t Sequim have a lot of first time home buyers? The Sequim economy does not have an industrial or manufacturing base. We don’t have a major tourist industry, although tourism is important. Washington’s high tech companies are based in Redmond and around Bellevue, not Sequim. Sequim does not have destination resorts or convention centers. There are very few jobs in Sequim for young workers. And the jobs we do have for young workers, like teaching and government services, tend to be filled with people who do not plan to leave Sequim, so there is very little turnover of existing jobs. What does all this mean? For the real estate market, it means we simply do not have first time home buyers in any significant numbers. This might seem like a weakness in our real estate market, but it is actually a strength. Fluctuations in the national economy do not effect Sequim as much. Retirees have pensions and retirement programs that shield them and Sequim from economic downturns. While young couples can and do lose their jobs in recessions or downturns, and their homes can go into foreclosure, retirees in Sequim have stable incomes that do not suddenly end. We have few foreclosures in the area, and homeowners have the financial wherewithal to maintain their homes and yards no matter what the economy is doing. In many cities, like Tacoma or Seattle, first time home buyers are an important driving force, but they are not in Sequim. What’s New in the Sequim Real Estate Market? The Sequim real estate market is hot, and here’s why. Homes in many hot spots around the country, including California, Texas, Florida, Colorado, Nevada, and Arizona are selling within days after they are put on the market, and many are selling for full price (all cash) and others are selling at above the listed price after multiple offers compete. The Sequim real estate market is the beneficiary. Sellers in Sequim are selling their homes like nothing I’ve seen in the past eight seven years. When we were in the throes of the recession a couple of years ago, when buyers shared their final short list of homes to view just before arriving, maybe one on the list would be sold. Last February 30% of their list of homes were sold just before they got here. Last month 50% of their homes were sold out from under them, and this morning I saw a continuing trend. I received an email from a client with his short list of five (5) homes he wanted to see this coming Saturday. I began to pull each of these listings up from our MLS to schedule the showings, but all five are pending or under contract. I can’t guarantee this will continue, but the Sequim real estate market is definitely back from the dead. I haven’t seen homes sell like this since 2005. It’s good news for sellers, but for buyers the market is starting to turn from a buyer’s market to a more normal market. Some buyers are now having trouble finding their dream home, because the best homes in the best areas at the best prices have been selling, and that means the inventory of nice homes continues to shrink. Ladies and gentlemen, the Sequim real estate market is back from the dead. 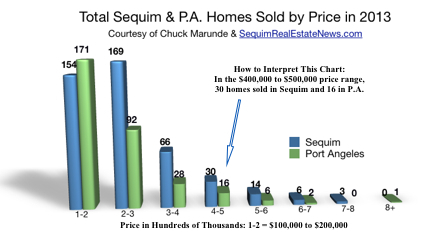 What are the prices of Sequim homes sold? And how does that compare to Port Angeles? If you’re looking at homes in Sequim or P.A., and you are wondering what the price distribution is for homes sold, this may be of interest. This data only includes site built homes and does not include mobile homes. 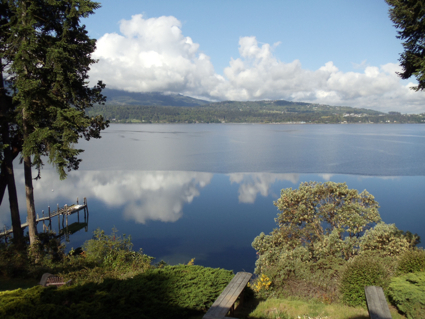 In 2013 a total of 154 Sequim homes sold from $100,000 to $200,000, and 171 Port Angeles homes sold. In the price range of $200,000 to $300,000 those numbers are 169 and 92, respectively. Generally, you could almost say that twice as many homes sold in each $100,000 price category in Sequim as in Port Angeles starting at $200,000. From $600,000 to $700,000 three times as many homes sold in Sequim as in P.A., and from $700,000 to $800,000 three homes sold in Sequim in 2013 and none in P.A. In the higher price ranges, only one home sold in Sequim and P.A. 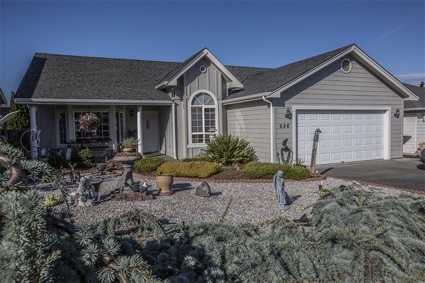 combined in 2013 above $800,000, and only three sold in Sequim above $700,000. Of Sequim homes and P.A. homes sold under $200,000, the vast majority are just under $200,000. In other words, don’t expect to find a livable home priced anywhere close to $100,000. A very humble home starts at around $175,000 plus. Now you know the prices of Sequim homes sold. 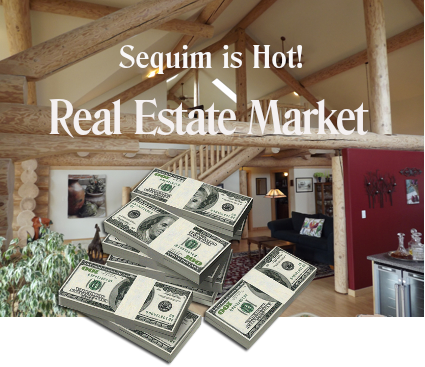 Sequim Real Estate Market Suddenly Hot! The Sequim real estate market is suddenly very hot. Buyers are here looking at homes in significant numbers, more than in a long time. They are writing offers. They are writing multiple offers on the same homes. They are competing, and some buyers are offering all cash in order to compete with other potential buyers who need financing. Spring has arrived early this year, at least as far as the buyers are concerned. Why are buyers more assertive than in a long time? Timing is everything, and many things have happened in these past few months and this past year. We have gotten through a very cold and harsh winter in many parts of the country. We are past the holidays. 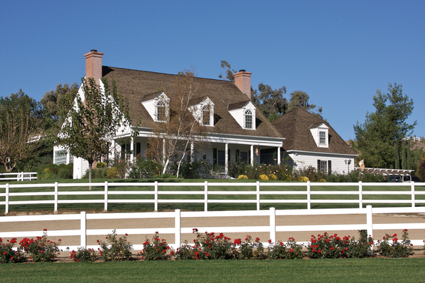 The real estate market has picked up dramatically in many places, including southern California. Some buyers have money suddenly. Everyone sees mortgage interest rates increasing, and it’s clear they will go higher. And we have a unique scenario right now where home prices are jumping in California and elsewhere, but prices have not jumped in Sequim yet. What a perfect buyer’s scenario in the Sequim real estate market. All of this has benefited buyers in the Sequim real estate market, and now is the right time. What are the implications for buyers coming to Sequim? If you find a home you like, and you want to make an offer on it, you cannot take your time and wait too long. There are probably one to two dozen other retirees like you looking at the same homes. If that home is priced at true fair market value, it may not be wise to make a low offer and go back and forth for days negotiating. Another buyer might slip in with a full price offer in cash as I just saw happen. None of this means that you should get in a hurry, but it does mean we are no longer in a buyer’s market in this Sequim real estate market. This is the Sequim Real Estate Market Report for January of 2014. It’s no surprise to me that January’s listings were down by 22% from one year earlier. There are other stats in this video, but one of the most interesting is the number of days on the market before selling. In January of 2013 houses averaged 195 days on the market, while in January of 2014, houses were on the market only 76 days before selling. That’s a whopping 61% reduction. Sales were up 62% this January compared with last January. That’s huge, too. I think it is fair to say that the Sequim real estate market is improving. This Sequim real estate market report is brought to you by Chuck Marunde and Sequim & Port Angeles Real Estate. This video report is short and concise, just the kind of video report consumers seem to love. There are several key pieces of information on this video, and after you’ve watched it, I’ll comment below. First, the number of active listings in Sequim is down in November compared to October by 19%, and the number of active listings is down by 23% compared to last year at this time. The average listing price in November is up from $255,000 to $300,000 compared to last year. The number of days a home was on the market before being sold was down 18% (132 days vs. 161 days). Now check this out. The number of homes sold in November of this year compared to last year increased by 88%! Wow. How shall we interpret this Sequim real estate market report? My interpretation is that the market has improved dramatically over last year. This is consistent with all of this data. We have fewer listings because homes have been selling and the inventory has been shrinking. I’ve been writing about our shrinking inventory for a while. Four years ago I suggested that we would find ourselves with a shrinking inventory with builders not building and a limited number of ideal homes that most retirees want. The average price of sold homes has increased by $45,000. That is a result of supply and demand. The number of days on market (DOM) has sharply dropped indicating that homes are selling faster in a tighter market. And sales increased by a whopping 88%! That certainly is a strong indication that the Sequim real estate market has improved substantially over last year. It's rare, but once in awhile life provides the perfect collaborator for an important endeavor such as buying your new home. For me that person was Chuck Marunde. His two decade background as a Real Estate Attorney, his prolific career as an author of articles and books on Real Estate and his forthright and moral character made choosing Chuck a no-brainer. Chuck is dedicated, thorough, incredible at the negotiating table, knowledgeable about all local laws & regs but, most importantly, Chuck loves what he does. And what he does is find his client the perfect property. Chuck isn't about making the sale, he's about making the sale that is OPTIMUM for his CLIENT and this makes Chuck a rare bird indeed. I love my new home in Sequim and I am indebted to Chuck for making it happen. Kevin E.
I’ve had the pleasure of working with Chuck over the past three years in selling my parent's estate. It was a tough time to sell during the housing recession, but Chuck always kept things on the positive side. With his real estate law background, he offers sound, practical advice. He helps you along with the process using discussions and reason, rather than opinions and speculations. If Chuck doesn’t know the answers, he will get them for you. In several instances, Chuck took the initiative to meet with county officials to get up-to-date facts about zoning and regulations. I was always impressed with his company’s tech savvy communi-cations and internet presence: weekly email updates, blogs, videos, links, Linked-in networking, etc. He is truly pioneering the future of buying & selling real estate. Brian M.
As an out of state buyer unfamiliar with the area, it was important to me not only to have a real estate agent who knew the area well, but also one who knew the value of the properties. I chose Chuck because he is also a real estate lawyer and it is reassuring to have that extra degree working for you. I selected the houses I was interested in on line before taking a two day trip to Sequim to look at them in person. I sent my list to Chuck, who gave me feedback, then organized our tour so we could see 16 properties in a short time. He was very accommodating, driving me all over Sequim, and rescheduling appointments when we fell behind on our time. On day two, I found my home and we drafted an offer on it that evening. By the time I arrived back home on the plane the next evening, my offer had been accepted. Chuck was honest about what it would take to get me into my new home, while having my back the entire transaction. Since I was unable to relocate immediately after closing, he and his assistant Ade, have been taking care of many additional responsibilities for me. He was a pleasure to work with. Chris D.
The best decision I made, once I settled on Sequim as the ideal place to spend the rest of my days, was to hook up with Chuck Marunde as my broker/go-to guy. He happily took on the entire complicated merry-go-round associated with a long distance move that involved selling in Southern California (with a different agent) and buying in Sequim – all in the span of just over a month. The unexpectedly quick sale of my previous home was already a week into a 30 day escrow when I got to Sequim for my house hunt. We had two days to find my slice of heaven. And day one was less than stellar, each home having at least one major issue. The killer was the dream home that turned out to be an unmitigated disaster once we got inside. I was crushed. Chuck had his work cut out for him that night. And he worked his magic. On day two there was one beautiful possibility, but not quite right. Suffice to say, in the early afternoon we pulled into a driveway and the first words out of my mouth were “That’s my house.” 29 days later I took possession of my new home. Every sale has its issues, but throwing in the complications of a short escrow on top of 1200 miles of separation from all documentation, etc. gives new meaning to “challenging”. Thanks to his encyclopedic knowledge coupled with a great sense of humor, Chuck was able to keep me on an even keel when things got dicey. He knows when to step in and when to let it evolve. I cannot imagine making this move without him. Rebecca B. "Andy Romano is a successful motion picture character actor with over 40 years in 'the Biz.' 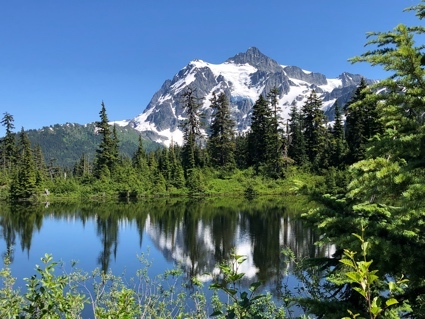 Mr. Romano has a home in beautiful Santa Barbara, California, but he chooses to live most of the time in Sequim, Washington on the Olympic Peninsula in the great Pacific Northwest. Why? In his own words, 'Because it's even more beautiful and surrounded by more beauty in this incredibly peaceful and quiet place. With respect to real estate agents or brokers, well my friend Chuck Marunde, owner of Sequim and Port Angeles Real Estate, is hands down the best there" Andy R.
I’ve known Chuck Marunde for several years. My wife and I bought and sold one house through his services, and now have another listed through him for sale. Whether Chuck was representing us as the buyer or seller, I am confident he always had our best interests at heart. He helped us set or negotiate a reasonable price, and made sure there was a clear and open line of communication. He responded rapidly to email and phone calls and always knew the best person to contact for the various services involved in a transaction. I have worked with quite a few real estate agents and Chuck is right at the top of my list of good ones. Actually, Chuck is first and foremost just a good person, and he carries his personal honesty and integrity over into his profession. He has the greatest depth of experience in real estate of any agent or broker I have known. His years of practicing real estate law prior to becoming a broker are evident in the meticulous care he takes with the process and documentation. I am impressed by the way Chuck has integrated internet services into his real estate business. He probably knows more about this process than any other realtor in the country. In this tight market it is important to use every possible means to spread the word about available properties…to reach the few people who might be interested in a particular property. Steve L.
Buying a house is always a stressful time in life. Advice to Buyers: choose an agent who is competent, communicates well, and has exceptional follow-up and follow-through! You will spend a lot of time with your agent during the process. Choose someone likable. Go with your gut. I got to know Chuck during the process, and he's a great guy! You need an agent who is competent to handle and help you negotiate the issues that come up during disclosure, home inspection, appraisal, etc. Chuck's competence is superb! I got truly professional, sound, straightforward advice. Chuck's communication skills are exceptional: phone, email, fax. He has a wonderful ability to stay "on-point" with what is actually important and doesn't lead you astray on issues that aren't so important. Chuck's turn-around time on questions, issue resolution, etc. was virtually always within 24 hours. He follows-up, follows-through. He does what he says he will do timely. This relieves a lot of Buyer stress! 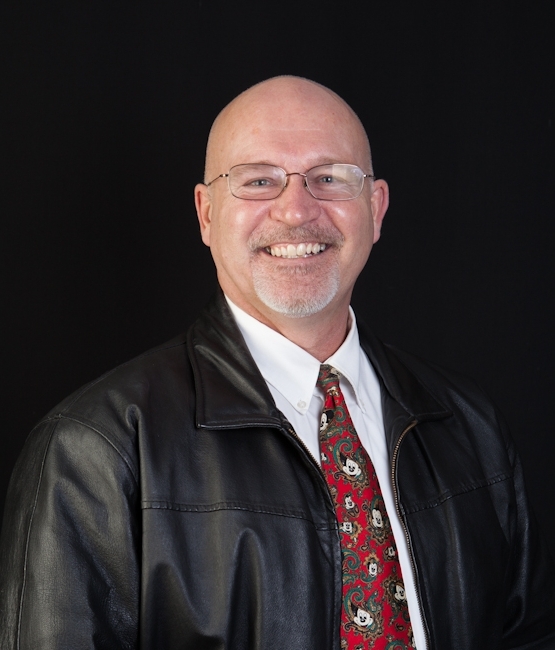 Chuck Marunde is the #1 Sequim Buyer's Agent, having sold more homes (by volume) to buyers than any other agent or any "team" of agents for the past seven years. He is the author of thousands of articles for buyers on this real estate blog, and he is the author of several real estate books for buyers and one for sellers. He is the creator of many free tools that buyers use and love every day. 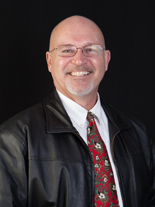 He is recognized as a national expert on real estate transactions, marketing, and negotiating. Please schedule your appointment to view homes with Chuck well in advance of arriving in Sequim. Why Does Port Townsend Stink? Should I Submit a Backup Offer on a Pending Transaction? 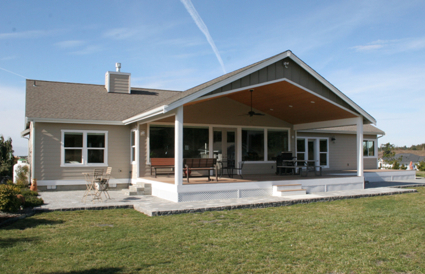 Why The Urgency to Buy a Home in Sequim WA? How Do I Sell My Home? Why is Sequim so Wonderful?